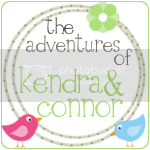 Well, last night I left both babies in Kendra's cot (to contain them during bedtime bottles) and when I walked back in, Kendra was sucking Connor’s dummy. We'd been practising saying "happy birthday" so that we could phone Dion's mother last week and let them wish her. So yesterday Dion told Kendra that it would soon be her birthday and granny would phone her to also say Happy Birthday. And then Granny will say Happy Birthday to Connor too. Connor says to Dion, "Daddy, where's Mummy gone?"